Rungry has been in full effect lately…well, more soccer-hungry than RUNgry but it’s all the same thing, ya know! Last night I managed a little 4k run on the treadmill when all I wanted to do was curl up in bed and relax. Seeing that I should be starting my 1/2 Marathon training now, I thought I should attempt another easy run. And that I did. I’ve started it but nothing concrete or set in stone. 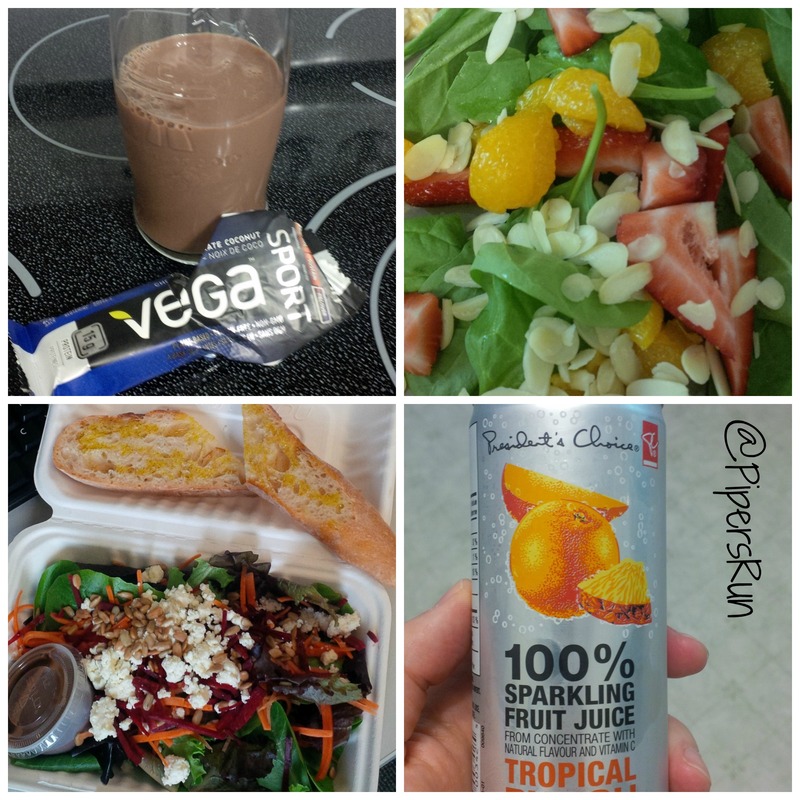 What I’ve been eating lately? Well, LOTS! 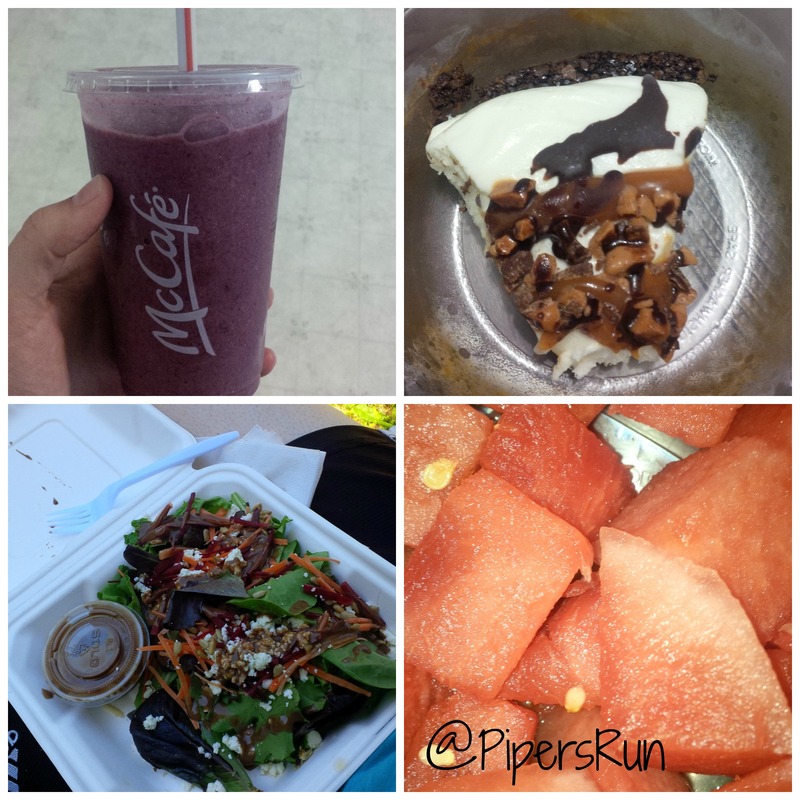 Post Soccer Eats: Blueberry / Pomegranate Smoothie, DQ Skor Ice Cream Cake/Pie, Salad and Watermelon. I seriously can’t get enough watermelon in my body. I eat it almost every day and sometimes twice a day, it’s a good thing my girls love it too! I’ve been on the road with work a little bit and we stopped at the coolest little cafe in Bear River, Nova Scotia. I would 100% make the drive down there (1.5 hours) just to go back to “Mrytle’s & Rosie’s Cafe”. We all order a burger; from left to right: Bacon, cheese and onion ring burger (mine); Philly Cheese burger and crap, I can’t remember the name of this burger. I know it had “a thousand salad dressing” on it, Melissa had it. 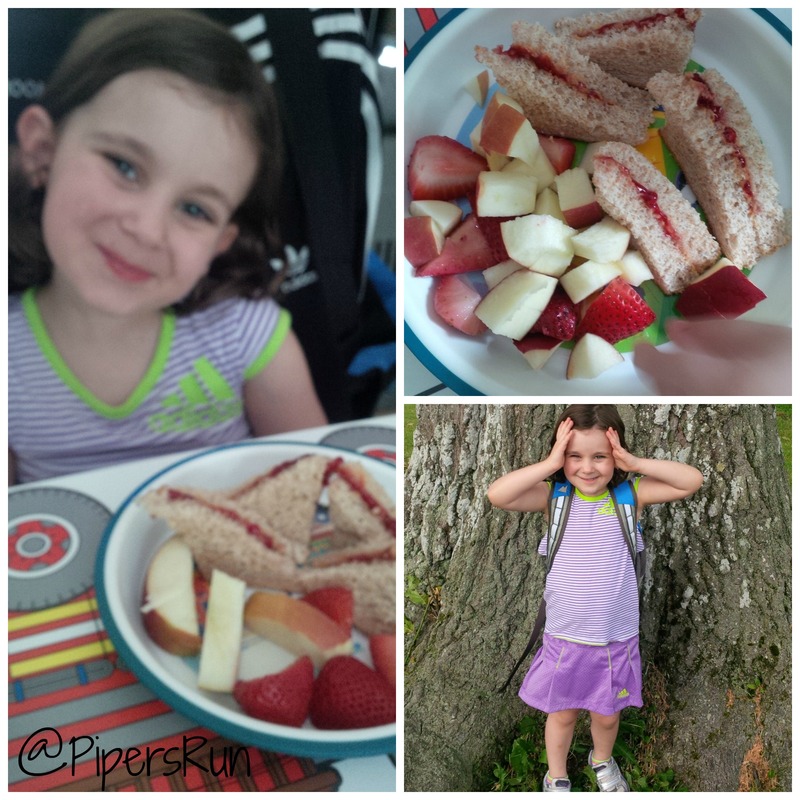 Well, this wouldn’t be a good post without sharing what the girls eat sometimes. This is on soccer night, when I rush home from work, pick up the girls, make PB & J sandwiches and usually veggies or fruit and then we rush out the door to soccer. AND…..now I’m rungry all over again! Ice cream over watermelon, for sure, unless it is just a bit, and then watermelon. And lately, I’ve been eating just about everything, so that isn’t a fair question! But lots and lots of cherries, that is for sure. And I had the absolute perfect, perfect, perfect summer peach yesterday. Holy bejesus. I just ate some watermelon…….YUM! Cheery’s are delicious! hmm, I’m tempted to stop at that restaurant on the way to Yarmouth next week! Rosslyn just agreed that it’s great too (She’s from Bear River). Krystol, you HAVE to go there. Ummm, frozen yogurt! I need get on that train! I’m definitely a huge fro yo fan and probably eat a little too much of it. And not just in the summer. I also love Italian ice and my brother now works at out local Italian Ice joint which is very dangerous indeed! I’ve been on a huge salad kick, and LOVE watermelon! YUM!